Around the world, Internet freedom is deteriorating, with some governments taking down their mobile Internet service, restricting live video streaming and employing a digital army of pro-government commentators. These are some of the findings of “Freedom on the Net 2017,” an annual report by Freedom House, a global non-profit that tracks democracy and freedom around the world. According to the report, which covered June 2016 to May 2017, about half of the 65 countries assessed – which covers about 87 percent of all the people online globally - saw their Internet freedoms decline, with the Ukraine, Egypt and Turkey showing the most notable one-year erosion of freedoms. China remained the world’s worst abuser of Internet freedom, followed by Syria and Ethiopia, the report said. Sanja Kelly, director of the Freedom on the Net project at Freedom House, said the decline of Internet freedoms has coincided with the rise of Internet access worldwide and people increasingly turning to the Internet to promote democratic reforms and greater human rights. “One of the reasons why we are seeing greater restrictions is precisely because some of the leaders in authoritarian countries, in particular, have discovered the power of the Internet and are trying to come up with innovative methods to suppress that,” she said. Until recently, some governments in Africa and other parts of the world didn’t pay much attention to the Internet, focusing instead on traditional media, such as broadcast. That focus shifts when Internet penetration reaches 20 to 30 percent of the population, she said. “Suddenly the governments start taking note and we start seeing propaganda actions,” she said. Countries such as Zambia and Gambia have shut down mobile access to the Internet, particularly around elections. • Online manipulation tactics played a role in elections in 18 countries. 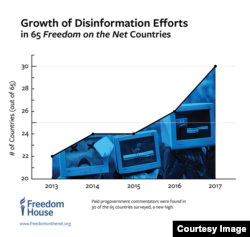 • Governments in 30 countries promoted distorted online information, up from 23 the previous year, employing tools such as paid commentators and false news sites. • Half of all Internet shutdowns were focused on mobile connectivity, with most shutdowns happening in areas populated with ethnic or religious minorities. In October 2016, the Ethiopian, government shut down mobile networks for nearly two months as part of a state of emergency amid antigovernment protests. Belarus disrupted mobile connectivity to prevent livestreamed images from reaching mass audience. Bahrain has issued a specific law that news websites are prohibited from using live video on their websites. • In 30 countries, there have been physical reprisals for online speech, up from 20 countries in the prior year. Not long ago, some of these online suppression techniques were mostly employed by China and Russia. “The extent to which these techniques are being used and the number of countries where they are present is something in itself new,” said Kelly.